Ubisoft’s copyright on such assets. Of course on my mods this assets can be modified or increased in order to fit the lore, mechanics, animations, and other goals, of the mod for Tes 5: Skyrim where they are now part here on my nonprofit creative series, but this modifications are not endorsed by Ubisoft, just kindly allowed by her. Users: as allways you can use my mods on your mods, but if the assets or part of the assets of a mod of mine you want to use have this disclaimer, please post this disclaimer on your mod page, and follow the same usage rules. Ubisoft is showing us again how great and kind she is with the fans. Thank you very much Ubisoft and associates, and thank you very much Nexus. 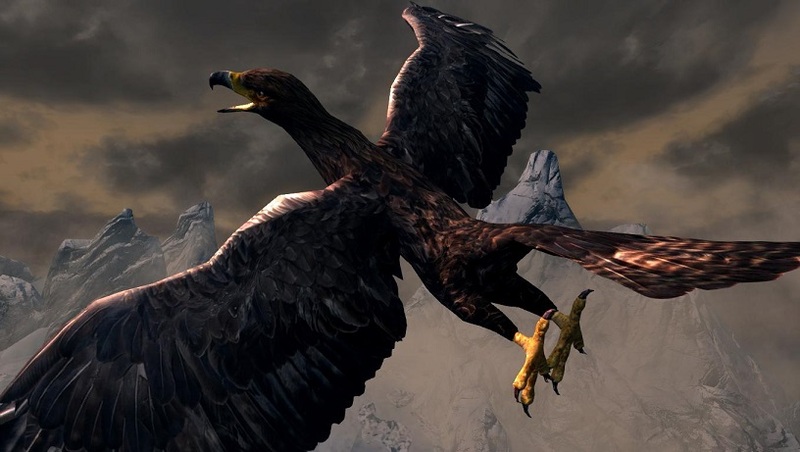 Large birds of prey from the snowy mountains of Tamriel, with sharp beak, long claws, a powerfully built body and large wings, they’re deadly enemies of the Dragons, and despite being smaller and commonly weaker, they are much faster, both on land and air. You can commonly find 2 variants in skyrim, both on the north areas, one being the black Giant Eagle, half the size of a regular dragon, she commonly lives in couples, and hunts mainly on glaciar areas, seeking prey on large snowy plains. The second one is the Atmoran Eagle, bigger and bulkier than the regular Giant Eagle, this solitary brown bird seems to choose mountain forest areas to hunt. Back on Atmora this species was one of the few able to hunt Wampas﻿.